Yesterday I passed a milestone that my father, his father, or few males on that side of my family have reached in several generations. The male average age at passing has been 54. I reached the big 7-0, and I’m just proud to be around. But once a person passes ‘a certain age,’ birthdays cease to be about presents and begin to be thinking about friendship and longevity. Much of my day yesterday was expended personally answering all 145 birthday wishes. from my fantastic family and friends on Facebook and Messenger, taking phone calls from my lovely daughters, enjoying my cards, and being taken out to a great steak dinner by my wonderful Rhonda, who also baked me a cake, which went down scrumptiously with rich cookies and cream ice cream. I share my birthday with some pretty terrific folks including Davy Crockett, Mae West and Sean Penn. But at the beginning of the day I had received a super surprize when my oldest daughter informed me that my latest great grandchild had been born on this birthday! He’s a boy named Milo, and he’s in Texas! What more could I ask for. It’s for sure that I will always know how old he is, and know when to wish him the best birthday ever! Two dreaded terms in the 19th century about travel on rivers! In pole vaulting they raise the bar to determine greatest ability. But where did the expression ‘Raise the bar’ really come from? A similar citation appears in a New York Court of Appeals record in 1942 in regard to raising the bar of a statute. In fact, the first available reference to raising the bar for high jumping does not come until a Life Magazine article on July 13, 1953. “To be great is to be a nonconformist” is one of the entries in my new book, Most Comprehensive Origins of Cliches, Proverbs and Figurative Expressions, Volume II, being released on August 25. This is actually a misquote of Ralph Waldo Emerson, nevertheless, it contains much truth. Some nonconformists actually have little to offer, but among them have arisen those who have “turned the world upside down” (another saying from the book). On Amazon.com, 19 people have posted reviews of the original volume of this book. Of those, 15 have been five stars. The other three ‘just didn’t get it.’ One didn’t like it because it didn’t consist of all cute little anecdotes. Another didn’t like the fact that some expressions were not included. The other said there was ‘no index,’ thus he could not use it as a reference. Give me a break…Oh, yes, that one’s in the first book. The very reason that some may not appreciate this work which took many years of research is that it IS NOT just cute stories. In origins, these are the commonly passed down myths about how something started. If this is what you are looking for, please don’t bother to buy one of these books. I spent all the thousands of hours in research because all I want is truth. I plainly stated in thee introduction to the first book that all phrases could not be included in one volume. I can only print so many pages at a time. And what about an index? These are dictionaries. No dictionary has an index. They are in alphabetical order! If you want to find out the most likely origins of the things we say every day, do buy my books. Thousands have loved them. I appreciate all of those who do! 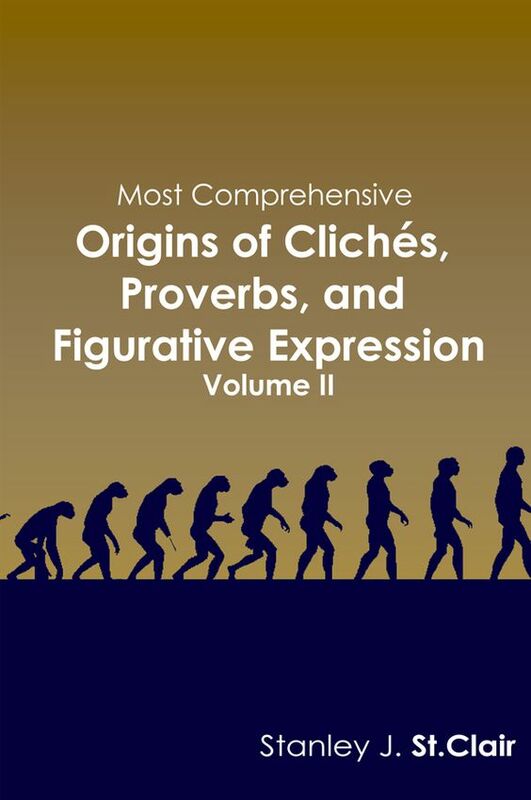 Based on present progress of final analysis and minor changes being made from the proof of my new book, Most Comprehensive Origins of Cliches, Proverbs and Figurative Expressions, Volume II, I now am able to announce the new early release date! That date is August 25, 5 weeks and 2 days ahead of originally planed schedule. This is being expedited due to other books which are coming from other authors which will demand my attention. As soon as I know the dates, I will announce my interview on local radio and book signing at the local library which will launch sales here. Where did the derogatory term “Shameless hussy” come from? After this, hussy began to revert to mean an immoral woman, often with Centlivere’s ‘shameless’ before it.